The story essentially surrounds teenage runaways Hye-Sun (Shim Eun-Kyung) and her boyfriend Ki-Woong (Lee Joon). Ever since Hye-Sun fled her father’s home she has met nothing but bad people and was forced into prostitution. Ki-Woong rescued her and they now live either by hanging out in PC bangs or cheap inns but with money running low they face being forced out on to the streets. 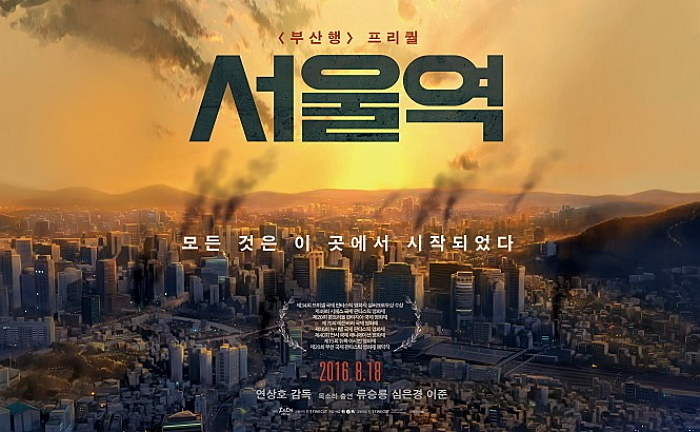 An argument over how to get cash sees them separate just as the homeless community who camp in Seoul Station for shelter become ravaged by a zombie virus and the infected emerge from tunnels to attack the healthy. Where TtB is quick to get into the action, Seoul Station takes its time to allow for the build-up of the story and setting to allow us to get a sense of the characters who are not your usual leads. Instead of the rich and beautiful or poor and honourable, we are rooting for the survival of dispossessed and broken people. The issue of homelessness is given a lot of screen time from seeing the daily routine of those who use Seoul Station as a shelter when official shelters turn them away to how average citizens treat these castaways. Hye-Sun and Ki-Woong’s plight as youngsters on the margins is far too common in reality but not depicted that often in films and their journey to be reunited with each other forms the spine of the plot as we see them try and survive various privations and zombie attacks. In a typical zombie movie twist the real monsters turn out to be other people. The rest of society are shown to be pretty unsympathetic to these characters. The hypocrisy of how people are treated is made with dialogue full of progressive talk coming from people with callous disregard for down-and-outs who survive on scraps around the glamorous confines of the titular station and the violence of the state. Seoul Station opens with two young people talking universal healthcare and ignoring a homeless man who is seriously injured with a bite. The police treat the homeless and then, as the situation gets worse, regular citizens with government-sanctioned prejudice and violence. Normal people, be they police officers, station attendants, or shop owners treat the homeless and runaway kids like a nuisance and this attitude evolves into something more deadly as the infection runs rampant and their prejudice makes them even more irrational. The theme of selfishness that was present in the TtB is taken to extremes here with Hye-Sun’s sexual exploitation providing an incredibly ugly comment on the fate of those unfortunate to fall off the social ladder. Unlike TtB, the zombie virus is never even glanced at. What we see are the results and how those at the bottom of society are condemned to die at the hands of selfish people or an indifferent government. Images of riot police and soldiers taking to the streets and killing civilians will roil memories of Koreans who lived through military governments. Anybody with an ounce of empathy with feel it come out as the film works up some tragedy in a series of easily avoidable clashes and a deadly twist. If nothing else, the film proves to be an effective social drama. Perhaps this is one of the benefits of it being an animation. A live-action film this bleak and with subjects this difficult might not get financed and this is clearly low-budget as can be seen on screen. The animation is detailed in terms of backgrounds in some scenes while all details, including faces on minor characters, fade out in others. This isn’t so much a problem since the action takes place in the bland alleys and stations of Seoul but it isn’t the most interesting thing to watch especially since the colours are mostly lifeless gradients of grey. For a film set in down-town Seoul, one would expect more neon and the use of light and dark could have made for interesting visual contrasts and even story points. The character design and animation is also limited. The same few character models are used in some scenes with only a change in colour of an item of clothing to differentiate them and, considering the population of Seoul is around 10 million people, there is a significant lack of characters in scenes (even if it takes place at night when most people are sleeping). All of this gives a lifeless feeling to the film. While the animation lacks dynamism the sound design is fantastic as full use of locations is made to bounce the echoes of the infected around. These Zed-heads sound like they are from the video game Left for Dead and they move erratically like them as well. Overall, the film’s power lies in its social content which gives the film its dramatic impetus and its emotional power at the end. 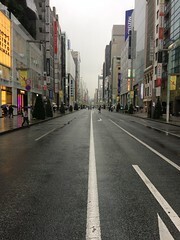 The unfairness of Seoul is write large on screen and proves to be a bigger monster than the infected. I agree! That moment was the most shocking part of the film. It was like the story held him out as some sort of hope and then snatched it away. He got his comeuppance.